Whether you're transferring your vinyl and cassette collection to iTunes, creating a podcast or recording the soundtrack for your holiday video, the typical music recording program is likely to be overkill, and unnecessarily clumsy to use. In professional circles too, broadcasting, record mastering, voice-over recording and so on rarely need the full-blown multitrack music approach. One app that's been serving this pro market for many years is Bias Peak Pro, while its smaller sibling, Bias Peak LE, brings these abilities to home users. Peak's default file format is AIFF, but it will handle a wide range including MP3, AAC (not Protected AAC), WAV, FLAC and others. Files may be mono, stereo or dual-mono, and that's it - two tracks max. You can record from any physical audio input including USB or FireWire devices. Peak can't directly capture streaming or system audio, but it does come bundled with a copy of WireTap Pro that can. In terms of recording, there are other cheap, or even free, applications that will do as good a job. Where Peak LE stands head-and-shoulders above them is in audio editing. With most applications you'd need to find your edit points by sight from the waveform or try to spot the correct point as the playback cursor whizzes through. Then it's trial and error until you get it just right. High-end professional editing programs - and Peak LE - do it differently. They offer dynamic audio scrub, which plays back a continuous short loop, typically about 50ms, as you drag the mouse cursor left or right. This enables you to find a specific note, an offending crackle or the start of a word with great speed and accuracy. Having placed the edit correctly, you may still be left with an audible blip from the discontinuity. To smooth this out, Peak LE offers a Blend option. Or, for the ultimate precision, there's a Pencil tool, which enables you to redraw the waveform by hand. We found blending very effective for most edits and the pencil useful for removing sharp clicks and spikes. If the only editing you ever do is removing the silent gaps between tracks, then any audio editor will do the job. But for seamless editing of speech or music, techniques like these are a major benefit. Although the basic layout and operation of Peak LE 6 are little changed from the previous version, the windows have been smartened up a bit and are now "magnetic" so they'll arrange themselves more neatly. The precision of the level meters has been improved and there's a new Voiceover Ducking option that will automatically reduce the level of existing tracks when any audio, such as a voiceover, is pasted onto it. Also new is the ability to create and upload podcasts from within the application without the need for any additional software. But if you're not into publishing podcasts, you may be more interested in Peak LE's new ability to transfer tracks or playlists directly into iTunes. Plug-ins are an essential feature of all serious audio apps. With that in mind, Peak LE supports Audio Units and VST plug-ins and comes with over 50 to get you started. 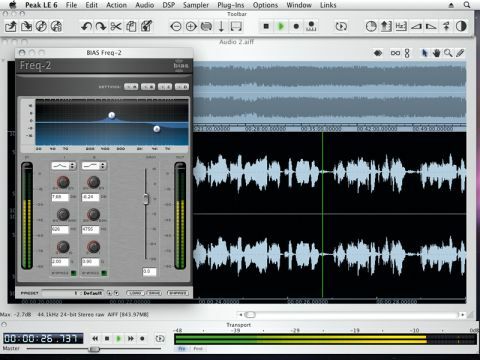 You can record through plug-ins or use them to tweak an existing recording and then bounce the result back. Rival apps such as Sound Studio and the free Audacity program offer alternative approaches that work well, but can't match Peak LE's power. For the price, it offers good value and a sensibly cut-down version of the pro app.